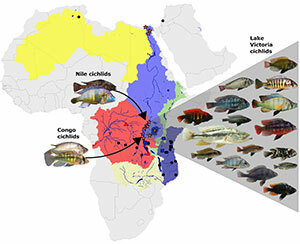 She and fellow researchers from Switzerland’s University of Bern and the Swiss Federal Institute of Aquatic Science and Technology have demonstrated for the first time that the rapid evolution of Lake Victoria cichlids -- brightly colored, perch-like fish -- was facilitated by earlier hybridization between two distantly related cichlid species from the Upper Nile and Congo drainage systems. The research is published today (Friday) in the journal Nature Communications. The first author on the paper, Joana Meier, is a Ph.D. student Wagner co-supervised at the University of Bern. Wagner, along with Meier’s other supervisors -- Laurent Excoffier and Ole Seehausen -- are senior authors of the paper. Wagner says the rapid evolution of the East African cichlids had puzzled researchers, who didn’t understand how a single common ancestor could divide into 700 species so quickly. The discovery that the ancestor of these fish species was actually a mixture of two different ancestors from different parts of Africa makes it “much easier to understand how the immense variety of fishes in this region have evolved,” she says. “An analogy is: If you combined the pieces from two very different Lego sets -- say, a tractor and an airplane -- you could get a much wider variety of possible structures,” Wagner says. The species that evolved exhibit many combinations of colors and are adapted to different habitats, such as sandy bottoms, rocky shores or open waters -- ranging from the clear shallows to the permanent darkness of the turbid depths, according to a media release from the Swiss Federal Institute of Aquatic Science and Technology. Depending on the species, cichlids may scrape algae from rocks, feed on plankton, crack open snail shells, forage for insect larvae or prey on other fish, including their eggs or scales. This modified diagram from Nature Communications shows the region of Africa and the different types of fish that have evolved from hybridization that took place about 150,000 years ago. The hybridization event probably took place around 150,000 years ago, when -- during a wet period -- a Congolese lineage colonized the Lake Victoria region and encountered representatives of the Upper Nile lineage. Across the large lakes of this region, the hybrid population then diversified in a process known as adaptive radiation, or evolution of multiple new species adapted to different ecological niches. While the precise course of events in ancestral Lake Victoria has yet to be reconstructed, it is clear that, after a dry period, it filled up again about 15,000 years ago. Descendants of the genetically diverse hybrid population colonized the lake and, within the evolutionarily short period of several thousand years, diverged to form at least 500 new cichlid species, with a wide variety of ecological specializations. The particular genetic diversity and adaptive capacity of Lake Victoria’s cichlids is demonstrated by the fact that more than 40 other fish species -- which colonized the lake at the same time -- have barely changed since then. The study involved sequencing over 3 million sites in the genome of 100 cichlid species -- a task which, until recently, would not have been feasible. Wagner’s study of evolutionary adaptive radiation earned her the 2015 Theodosius Dobzhansky Prize as an outstanding young evolutionary biologist from the Society for the Study of Evolution. Wagner received her Ph.D. from Cornell University in 2011, and she was a postdoctoral research associate at the Swiss Federal Institute of Aquatic Science and Technology before starting as an assistant professor at UW in 2015. She received her bachelor’s degree in biology and geology from Whitman College.